Retirement is a big decision, and one important factor to plan for is the day you choose to retire. When you’re eligible and ready to retire, you can select any day as your retirement date. You can even choose a weekend or a holiday. Generally, your retirement date is the first day you don’t work. It could also be the first day you don’t get paid by your employer (for example, if you use accruals before your retirement date). Another thing to keep in mind when choosing your retirement date is when you’ll receive your first benefit payment. Once we receive your retirement application, we begin the process of gathering service and salary information from your employer to come up with your final benefit amount. Most retirees are eligible to receive partial monthly pension payments while we work on calculating their final benefits. We base your partial payments on your most recent NYSLRS retirement estimate. These monthly payments provide 90 to 95 percent of what your final pension benefit amount is estimated to be. You’ll continue to receive partial payments until we finalize your benefit. Partial payments are mailed to the address we have on file for you. This is where your retirement date comes in. 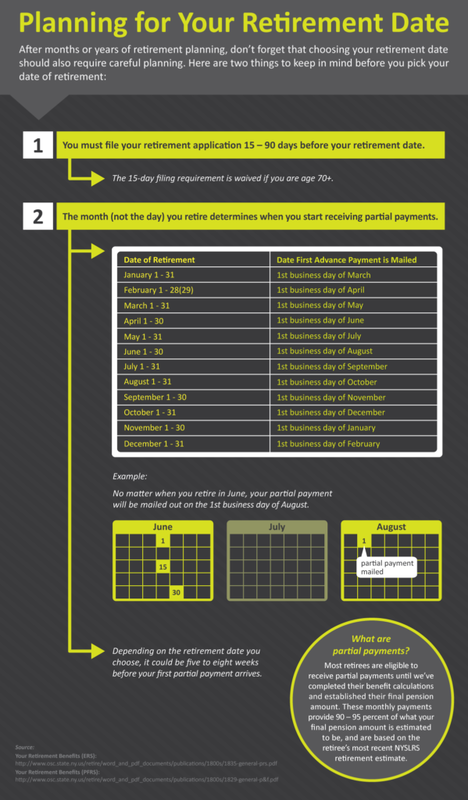 The month you retire determines when partial payments will start, not the day. If you retire in March and are eligible to receive partial payments, your first partial payment would be mailed on the first business day of May. It doesn’t matter if your retirement date is March 1 or March 31: your payment will go out on the first business day of May. You can enroll in our Direct Deposit Program at the same time you file for retirement. As soon as we are able to, your payments will be directly deposited into your account. Keep this in mind before you settle on a date. You may need to set some money aside, as it could be five to eight weeks before your first partial payment arrives. Many retirees retire on the last day of a pay period (so final payment information is available from their employer sooner) toward the end of the month to minimize the number of weeks before they receive their first partial payment. Once you have a day in mind, when should you apply for retirement? You must file your retirement application with us 15 to 90 days before your retirement date. If you’re over age 70 at retirement, or if you are no longer actively employed by a public employer, you don’t have to wait the 15 days. The application is also available from your employer or can be found on our website by clicking the link above. You may also want to visit one of our consultation sites. Content last revised April 20, 2016. This entry was posted in General News, Members and tagged after you retire, beneficiary, benefit payment, benefits, defined benefit plan, defined benefit plans, direct deposit, ERS, filing, filing for retirement, Final average salary, Information is the Key, know your benefits, members, New York State & Local Retirement System, NYSLRS, partial payments, pension payment option, PFRS, Preparing to Retire, retirement, retirement age, Retirement date, retirement plan, retirement planning, Service credit, Service retirement benefit, Vested on April 20, 2016 by NYSLRS. When a NYSLRS member dies, whether before or after retirement, it’s important that survivors report a member’s or retiree’s death to NYSLRS as soon as possible. But long before that happens, you should talk to your loved ones and provide them with the information they’ll need when the time comes. Let them know your wishes, where to find important papers and what steps they need to take. And if your documents are organized and accessible, it will make things that much easier. Our publication, Getting Your Affairs in Order and A Guide for Survivors, provides step-by-step guidance about what should be done now and after a member’s or retiree’s death. Survivors can report a death by email, phone or mail. They will need to send us an original certified copy of the member’s death certificate regardless of how they notify us. The deceased member’s retirement, registration or Social Security number. Please note: Our customer service representatives cannot release the identities of a member’s or retiree’s beneficiaries over the phone. The deceased member’s date of death in the Comment field of the form. Their own address and daytime phone number in the Comment section in case we need to reach them for more information. 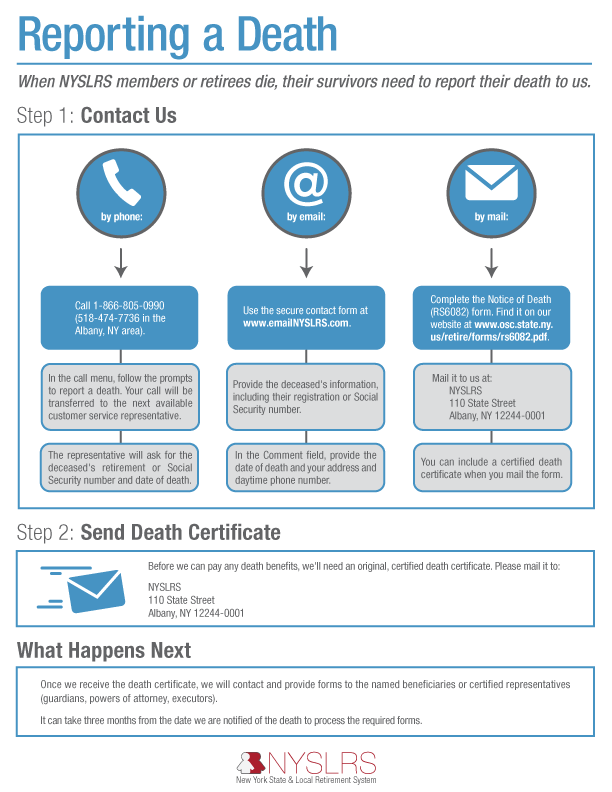 To report a death by mail, survivors should send us a completed Notification of Death (RS6082) form. Once we receive the death certificate, we will send beneficiaries or their certified representatives (guardians, powers of attorney, executors) information about death benefits and, if applicable, information about continuing monthly retirement benefits. We will also send them forms to complete. Beneficiaries should be aware that it could take three months from the date we are notified of the death before any death benefit is paid or any monthly benefit payment begins. If a member is retired when he or she dies, we will stop payment of any outgoing pension benefits. Survivors should be aware that any uncashed pension checks in a deceased retiree’s name must be returned to us. We will automatically reclaim any direct deposit payments that went out after a member’s death. Content last revised March 28, 2018. This entry was posted in General News, Members, NYSLRS Retirees and tagged beneficiaries, benefits, death, Death Benefits, death certificate, ERS, Information is the Key, members, Notification of Death, NYSLRS, NYSLRS Retirees, PFRS, Reporting a death, retirement planning, survivors on April 13, 2016 by NYSLRS. Did you become a member of the Employees’ Retirement System (ERS) before July 1, 1973? If you’re still working in public service, you’re one of the 3,508 active members in Tier 1. If you joined after July 1, 1973 but before July 27, 1976, then you’re one of 4,127 active members in Tier 2. Members must be at least age 55 to be eligible to collect a retirement benefit. There are no minimum service requirements — they may collect full benefits at age 55. Members must have five years of service and be at least age 55 to be eligible to collect a retirement benefit. The full benefit age is 62. Almost 95 percent of active Tier 2 members are covered by the New Career Plan (Section 75-h or 75-i). Final average salary (FAS) is the average of the wages earned in the three highest consecutive years of employment. For Tier 1 members who joined NYSLRS June 17, 1971 or later, each year used in the FAS calculation is limited to no more than 20 percent above the previous year’s earnings. For Tier 2 members, each year of earnings is limited to no more than 20 percent above the average of the previous two years’ earnings. For Tier 1 and 2 members, the benefit is 1.66 percent of the FAS for each year of service if the member retires with less than 20 years. If the member retires with 20 or more years of service, the benefit is 2 percent of the FAS for each year of service. Tier 1 members and Tier 2 members with 30 or more years of service can retire as early as age 55 with no reduction in benefits. Both Tier 1 and Tier 2 members who worked continuously from April 1, 1999 through October 1, 2000 receive an extra month of service credit for each year of credited service they have at retirement, up to a maximum of 24 additional months. If you have questions about the New Career Plan, please read the Tier 1 plan publication or the Tier 2 plan publication. You can find other plan publications on our website. Content last revised April 6, 2016. This entry was posted in General News, Members and tagged Benefit eligibility, benefits, ERS, FAS, Final average salary, Information is the Key, know your benefits, members, New Career Plan, New York State & Local Retirement System, NYSLRS, Preparing to Retire, retirement plan, retirement planning, Service credit, Tier 1, Tier 2, Vested on April 6, 2016 by NYSLRS.